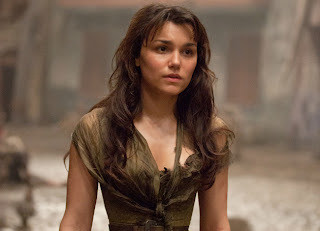 Eponine is the daughter of the Thenardiers and her brother is Gavroche. Cosette lives with her until age seven. As a child she is spoiled by her mother and ignored by her father. When she grows up she is very poor and her parents show no interest in her, unlike Cosette who becomes rich when she leaves with Jean Valjean. She falls in love with Marius, a revolutionary activist, but he never sees her as anything more than a friend. Marius instead falls for Cosette, and because of Eponine's great love for him she even acts as a messenger for the two. She even leads Marius to Cosette. Her support for Marius cause as a peasant makes Marius somewhat of a hypocrite for not returning her love and rather falling for middle class Cosette. 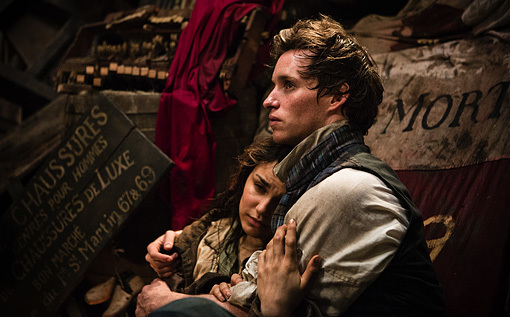 When going to Marius to give him a note from Cosette, Eponine is shot and fatally wounded. Dying a brave death, her last words are without pity and she peacefully passes. She dies in Marius's arms confessing her love for him. Her end is tragic as she was a very likable character. She is strong willed, and is willing to do anything for Marius. She is smart but uses her deviousness never to hurt anyone. She also grows up to be very different from her parents who were crooks obsessed with money. Due to her courageous and kind qualities her death is very sad. She is definitely a good character. She is what helps bring Cosette and Marius together and throughout the whole movie is just a very good friend to Marius. She dies a young brave death moving Marius to tears as well as her brother. It is interesting the way Eponine is still willing to help Marius with his relationship with Cosette. She is never mean toward Cosette throughout the movie even though she is extremely jealous. She never acts in a mean way towards any other characters and therefore causes us to pity her for her misfortune. This includes her parents, poverty, and impossible love. She is one of the most tragic characters in Les Meserables.